This feels like the early days of mobile. They’re big, they’re cluncky and they’re expensive, but you can already glimpse, that when they get small, smart and simple, they’ll be everywhere. We’ve been wearing technology for millennia; armour, prosthetics and for a couple of centuries glasses, earpieces and watches. 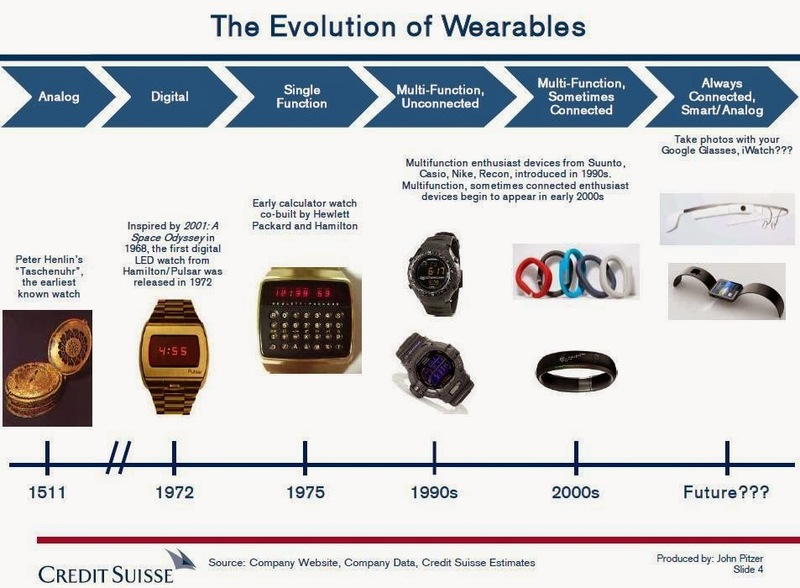 But we’re now on the verge of an explosion of intelligent wearable devices that help us perform tasks and learn. The reason it is happening now is that the communications' protocols are already here (Bluetooth etc.) and the sensors and chipsets are getting dirt cheap. Investment is also pouring in, as is the marketing push (Wearable Conference in London next month ). It’s not a matter of whether it will happen, only when. Once you see wearables as the inevitable consequence of an on-going process towards frictionless communications, action and learning, it’s easy to see that they enhance learning by reducing cognitive load and friction. Technology works best when it’s fast. Producers and consumers know this, so the trend towards making things smaller, faster, cheaper and wireless has been relentless. Ask someone for the time and they root around in their pocket for a mobile – but this is slow. In learning, anything that speeds up the time between intention and action, is good. If I want to know something now, I don’t want to haul out a volume of Encyclopaedia Britannica or worse, troop off to the library. Miller’s research at IBM showed that anything above 2 seconds led to people giving up and more recent research has seen this ‘acceptance’ time drop to below a second for crtical learning but longer for discretionary. Nass & Reeves did research at Stanford that showed the devastating effect of latency and pauses on learning. Learners want powerful, personal and portable access to knowledge and learning. I wear glasses, have a watch, earphones and a titanium plate in my wrist. I’ve been donning wearables for decades. My glasses enhance my learning in the sense that I could read almost nothing without them, either in print or on the many screens I use or presentations I watch. I have earphones that I use to listen to podcasts, YouTube and music. In other words, my wearables are already learning channels. Search for knowledge, support and record a lecture, presentation, slide, conversation, bits of TV or browsing the web. Access to text, audio, images and video is one form of communications. Incoming texts, emails and social media is another. This habitual capture of relevant learning experiences is now a key method of informal learning. At this level learning by doing will be eminently possible using playback video, audio, text and images. For example, surgeons now performs operations wearing Google Glass narrating their procedures, while students watch and listen outside of the operating theatre. You can see how this could apply to many hazardous and dangerous real life tasks. Learning by doing will be eminently possible using playback video, audio, text and images. Initially one can learn skills through exemplar video. Up the game with a step-by-step walk-through as you perform the task. Real tutors and coaches can deliver realtime advice and support. You can even perform and video the task for assessment. This could be a boon to those learning vocational and practical skills. Wearables can be used to reinforce learning to shunt knowledge and skills from short to long-term memory. We may finally have the solution to that age-old problem – the ‘forgetting curve’. Specific applications could take learner-generated cues from a specific course, lecture or presentation, and present them at spaced intervals. Alerts and prompts for action could also be useful in terms of nudges towards learning goals and changing or encouraging learning habits. Learning is habit (see h-learning). Even better if it anticipates my intention and delivers the things I need before I’ve even thought of them. That’s the real prize. Wearables such as Google Glass, through Google Now, already give you this. Learning often has a context, whether you’re driving, playing a sport, in a meeting, fixing something, learning a new skill, even looking up facts and knowledge. Wearables will know where you are, how you are moving and on the basis of past data and your preferences, anticipate what you want next. Overall wearables can make you more aware, thoughtful and mindful. More than this, they will enhance, facilitate and amplify learning. There are barriers, such as price, compelling benefits and social acceptance but wearables can reduce effort and cognitive load and make informal learning (and some formal applications) a reality. Resistance is futile. See this interesting short video from Dave Kelly on the learning applications of Wearables. A few years ago I went to a mobile learning conference in Tokushima in Japan. At the end of the conference the University computer scientists and the fashion students put on a wonderful display of the potential the fusion of fashion and technology. I took some pictures and wrote a piece for the then National College for School Leadership. They thought I was barmy!! This fits in with the pedagogic arguments I've been using for the use of AR in education. Delivering learning at the point of need is important. If you are teaching brick layers how to create a corner then they don't want to traipse off to the LRC and have to log on and find that video. They'll forget and watch that video of the idiot trying to skateboard down a set of steps! Deliver it there and then in context and you stand a better chance of it making an impact and actually transferring into something that is learnt. I heard that the design and build quality of the pebble time watch was the primary cause of concern in the first model. The plastic material of the watch made it look like a cheap product that is meant for small kids. It received huge criticism in the design category. Hence, Pebble decided to focus greatly on the design aspects. Truth to be told, they again failed to impress the users in delivering a quality looking product. Appearances are extremely important if you are investing hundreds of dollars in a smart watch. I had learnt it from topgizmo about how to choose the best wearables for our purpose.